 Katerina here is a Ruthenian peasant woman who, before the Holocaust, worked for Jewish families--families whom she feared, was fascinated by, stole from, and ultimately identified with so oddly that their memories will very much determine the course of her largely cursed life. She is mystified by the probity and the gentleness of the Jews, horrified by their elastic struggle with their own faith and their way with commerce; she drinks and she steals from them almost unconsciously, yet they develop into paradigms in her mind--especially of suffering: The family she first is employed by is destroyed in a Polish pogrom. Katerina eventually insists an illegitimate son born to her be circumcised and speak Yiddish. When the boy is killed by a drunken suitor, she stabs the man and is sent to prison--where, at a distance, she learns of the Jews' ever more methodical destruction. When they are all gone from Poland, she is released. Appelfeld (The Healer, 1990; For Every Sin, 1989; etc.) in keeping Katerina in prison for so much of the book's second half, sacrifices the freshness of incident for an artificially concentrated meditation on anti-Semitism. 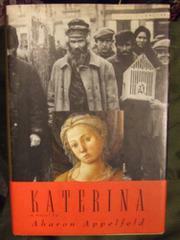 But Katerina in the actual company of Jews makes for remarkable fiction. Jewish ambivalence and self-loathing contrast with her equally inchoate unease; and one brilliant scene, the burial of one of her employers, a cultivated Jewish pianist--money and grief and argument melded in a phantasm of Jewish essence--is an astounding achievement, among the best pages Appelfeld has ever written. Structurally flawed, but very intense, disturbing.